Freeths’ Sheffield office continues to grow its business and commercial offering with the recruitment of a new Partner and Associate to its Sheffield Dispute Resolution team. These appointments strengthen the already excellent depth and breadth of Freeths’ northern commercial disputes service provision. Also joining with James from Irwin Mitchell LLP is Ciaran Dearden who is an Associate and was shortlisted in 2017 for the Junior Lawyer of the Year by the Law Society of England and Wales. Ciaran also deals with a wide variety of commercial disputes and has particular experience in supporting both directors and shareholders and matters involving fraud. 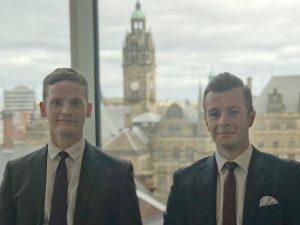 James and Ciaran are the latest additions to Freeths’ growing Sheffield office and follow the Dispute Resolution team’s previous appointments of Senior Associate Mark Gudgeon and Associate Lisa Greenstreet.